New Delhi : Only 29% of India’s internet users are women. Unless this digital gender divide is bridged, India’s aggressive push towards digitisation will further entrench the political, economic and social marginalisation of women. The bulk of policy and commercial interventions focus on improving access to internet services by upgrading spectrum and broadband infrastructure and bringing down the costs to individual users, in addition to facilitating the uptake of digital technologies through programs for digital skilling. Isolated technical solutions however, will be inadequate to address the social and cultural roots of India’s digital gender divide. Take mobile phone connections for example. While 43% of Indian men own a cellphone, women lag behind with only 28% mobile ownership. The gender gap in mobile ownership – estimated at about 114 million – reinforces the fact of unequal access, but also paints an incomplete and misleading picture. A survey we conducted in semi-rural Madhya Pradesh revealed that a majority of the women who owned a cellphone did not know how to operate the phone. Unable to read or write, they could not dial a number or read messages; most did not know their mobile numbers and had to ask their husbands. Their cellphone usage was mostly limited to pressing the green button when the phone rang. The digital divide is thus not simply a question of access to digital technologies but about the capacity to make meaningful use of the access to technology. In Madhya Pradesh, as in many parts of rural and semi-rural India, this capacity is directly shaped by gender biased belief and value systems that impose restrictions on the education and free mobility of women. Census 2011 data indicates that 65.46% of women are literate as compared to over 80% of men. Further, 23% of girls drop out of school before they reach puberty. A recent study, aptly titled ‘Whatever she may study, she can’t escape from washing dishes: Gender inequity in secondary education’, also finds that the engagement of girls in housework and domestic chores is the largest contributor to a gender gap in secondary education. Patriarchal attitudes and beliefs also restrict women’s rights to public spaces, preventing them from accessing community internet centers, outside employment, and co-ed training facilities. In many parts of India, not only do these social systems seem impervious to change, they seem to be becoming more deeply entrenched. Since 2010, there have been numerous report of khap panchayats and other conservative groupings banning or severely restricting mobile phone use for women; most recently, a panchayat in a village in Mathura announced that girls using mobile phones outside their homes would be fined Rs 2,100. A study by the Internet Democracy Project argues that in India, mobile phones make it possible to develop new ideas of the self, to explore and exercise autonomy, choice and agency. According to the study, “by creating all these new possibilities, and especially by creating spaces for privacy that were previously not available to young women in these communities, mobiles have disrupted the existing patriarchal regimes of control and surveillance.” It is precisely this possibility of choice and autonomy that the khap panchayats want to prevent, the study argues. Whether the bans have worked or not is in some sense beside the point; rather, what is critical is that without changes in deeply entrenched social and cultural values, digital technologies can act as tools of control and surveillance, not empowerment. The study also reinforces the inadequacy of a digital skilling approach alone. Numerous government and private sector-led initiatives are underway to train women to use specific applications like YouTube and PayTM. This is likely to yield positive results in the short-term by allowing women to access information and have greater control over their finances even when they are unable to, or are not allowed to venture out. However, this internet and communication technology-specific training can be problematic as a long-term strategy. While digital economy allows opportunities for ‘flexi-work’ and diminishes the reliance on physical workspaces, digital literacy must not aid in reinforcing the traditional gendered segregation of private and public. Unless accompanied by broader shifts in social and cultural belief systems, it can lead to further restrictions on the mobility and autonomy of women. Therefore, unless these digital skilling programs are grounded within a broader education curricula, they will create a generation of young people that are essentially only application operators, capable of specific tasks; not informed or empowered individuals capable of navigating and challenging deeply entrenched social customs and norms. Moreover, policy narratives tend to amplify the impact technology can have on women’s labour market and financial inclusion. While the focus on bridging the gender gap in digital access and skills is crucial for this to happen, it cannot make an effective dent on women’s inclusion prospects without the removal of implicit and explicit discriminatory barriers. The South African experience re-affirms that interventions aimed at access alone are insufficient. As per a 2016 study by the Finmark Trust, South Africa is the only country in the Southern African Development Community (SADC) in which the digital gender divide is narrow and women are more financially included than men with a positive gender gap of 6% in bank account ownership. Yet, women are more likely to have dormant accounts and have less access to the credit and savings market. 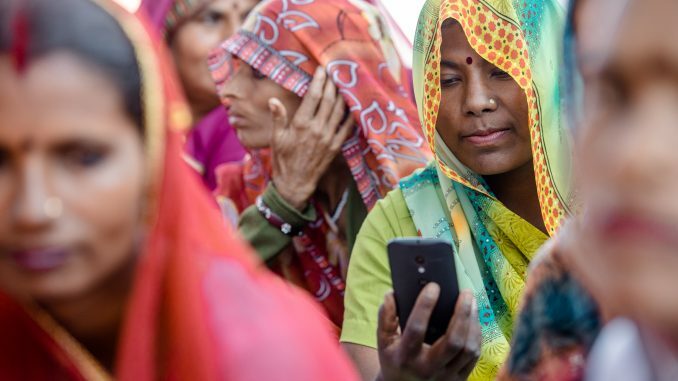 In urban India, gender-based digital exclusion is less pronounced as connectivity and literacy rates are relatively higher and social norms are less rigid. New opportunities are being created on the back of the boom in the IT sector and the expansion of the digital economy. Over the last 20 years, women’s enrollment in technical institutions has increased from 5% to 45% and outsourcing of business activities has created new information and communication technology jobs in service industries, some of which have been occupied by women. However, as studies show, women continue to be concentrated in “routine” back office services that require basic skills; ‘specialised’ jobs and managerial positions are dominated by men. For a small section of Indian women, new employment opportunities are also being created through the platform and shared economy, permitting them to circumvent barriers of physical mobility and balancing work-home commitments. However, this ‘gig-economy’ can come create new forms of contractual employment, without access to the social benefits and work place protection that comes with formal employment. Structural discrimination against women makes them particularly vulnerable and reinforces the need to develop alternative social protection mechanisms. It is estimated that the chances of women benefitting from opportunities accrued by the information society will be one third less than for men. Yet, India’s ICT policies and women’s empowerment strategies operate within separate silos. Although it’s already apparent that in the digital age, ‘online’ and ‘offline’ will be intertwined, policy communities and conversations continue to be fragmented. It’s time to acknowledge that technology by itself is not empowering; it must be inter-linked with broader policy interventions across social sectors. Otherwise, the digital age will only marginalise the marginalised, and exacerbate existing hierarchies between genders. Urvashi Aneja is co-founder and director of Tandem Research. She is also Associate Professor at the Jindal School of International Affairs & Research Fellow at the Observer Research Foundation. Vidisha Mishra is Junior Fellow at the Observer Research Foundation.